Supervised by young engineers, workers at the start-up company Chakr Innovation in New Delhi cut and weld sheets of metal to make devices that will capture black plumes of smoke from diesel generators and convert it into ink. In a cabin, young engineers pore over drawings and hunch over computers as they explore more applications of the technology that they hope will aid progress in cleaning up the Indian capital’s toxic air – among the world’s dirtiest. It jolted him into joining with two others who co-founded the start-up to find a solution. Dhupar had experienced first hand the deadly impact of this pollution as he developed respiratory problems growing up in Delhi. 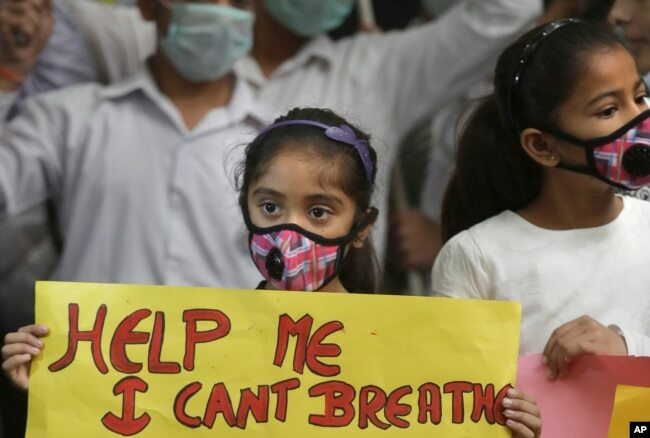 An Indian girls holds a banner during a protest against air pollution in New Delhi, India, Nov. 6, 2016. As the city’s dirty air becomes a serious health hazard for many citizens, it has turned into both a calling and a business opportunity for entrepreneurs looking at ways to improve air quality. 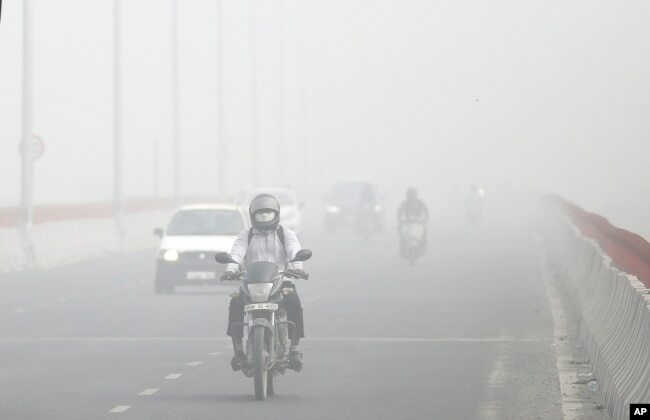 According to estimates, vehicles contribute 22 percent of the deadly PM 2.5 emissions in Delhi, while the share of diesel generators is about 15 percent. These emissions settle deep into the lungs, causing a host of respiratory problems. After over two years of research and development, Chakr has begun selling devices to tap the diesel exhaust. They have been installed in 50 places, include public sector and private companies. The technology involves cooling the exhaust in a “heat exchanger” where the tiny soot particles come together. These are then funneled into another chamber that captures 70 to 90 percent of the particulate matter. The carbon is isolated and converted into ink. Among their first clients was one of the city’s top law firms, Jyoti Sagar Associates, which is housed in a building in Delhi’s business hub Gurgaon. Making a contribution to minimizing the carbon footprint is a subject that is close to Sagar’s heart – his 32-year-old daughter has long suffered from the harmful effects of Delhi’s toxic air. Motorists drive surrounded by smog, in New Delhi, India, Nov. 8, 2017. “This appealed to us straightaway, the technology is very impactful but is beautifully simple,” says Sagar. Since it could be retrofitted, it did not disrupt the day-to-day activities at the buzzing office. “Let’s be responsible. Let’s at least not leave behind a larger footprint of carbon. And if we can afford to control it, why not, it’s good for all,” he says. At Chakr Innovation, cups, diaries and paper bags printed with the ink made from the exhaust serve as constant reminders of the amount of carbon emissions that would have escaped into the atmosphere. There has been a lot of focus on improving Delhi’s air by reducing vehicular pollution and making more stringent norms for manufacturers, but the same has not happened for diesel generators. Although there are efforts to penalize businesses that dirty the atmosphere, this often prompts them to find ways to get around the norms.